Excerpt: “Like many East Coast row homes, this 1885 townhouse has a long, narrow plan with windows only at the front and the back. This leaves a gloomy middle area on each floor level that wasn’t working for the young couple who purchased the townhouse in the historic Dupont Circle neighborhood of Old D.C. Contracting with BOWA, they asked for the traditional row house to be transformed into a light-filled, open-area home with a thoroughly modern aesthetic. Contracted for a whole-house renovation, the BOWA team began with a redesign of the creaky wooden stairs. 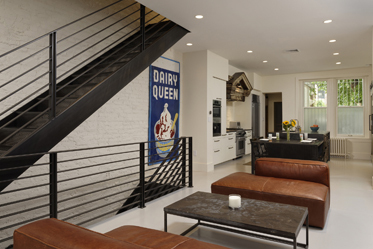 A steel staircase fit with the owners’ industrial aesthetic. Structural changes were needed in the building to accommodate the steelwork, but the design afforded perforated steel treads, which let light pass through from the skylight above (and increased air flow). View more photos and details on this project.